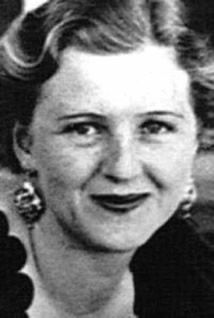 Citation: C N Trueman "Eva Braun"
Eva Braun was for years the mistress of Adolf Hitlerand for 40 hours his wife. Eva Braun first met Hitler in 1929 when she worked as an assistant to Hitler’s personal photographer, Heinrich Hoffman. Eva Braun was born in Munich on February 6th 1912. Her father was a school teacher and her mother worked as a seamstress before having children. She was educated for one year at a business school after leaving a Munich lyceum. At the age of seventeen Braun was employed by Hoffman at his Munich photographic studio. Hoffman followed Hitler wherever he went in an effort to get the best photos of the future Führer as both men knew that a good photograph was a powerful propaganda tool. It was when Hitler visited Hoffman at his Munich studio in October 1929 that he met the 17 year old. He was introduced to her as “Herr Wolf”. Braun was described as “tall, slim with regular features, pretty rather than beautiful.” (Snyder). At the time Hitler lived with his half-niece, Geli Raubal, in an apartment in Munich. It was only after Geli committed suicide in September 1931 that Hitler began to see more of Braun. Braun developed a love of sports and she had some ability in swimming, gymnastics and skiing. She was also keen on dancing. In the mind of Hitler, Eva Braun perfectly fitted the image of the female Aryan. After the 1931 suicide of Angela Geli Raubal, Hitler turned more and more to Braun for friendship. She officially worked as part of Hoffman’s photographic team, which meant that she could be part of Hitler’s entourage but without making it public that the two were seeing one another. Braun responded by following Hitler with devotion – but kept out of politics. While Braun was devoted to Hitler, he ensured that he controlled her life. Aware that public knowledge of their relationship might cause problems, she was effectively banished to the Berghof at Berchtesgaden. Hitler forbade her from flying and she was also not allowed to drive powerful motor cars. Servants at the Berghof were forbidden from talking to her and she only had a few female friends for company. Her wealth was ensured by Hitler when he assigned to her his photographic rights of the photos taken by Hoffman. If important guests arrived at the Berghof, Braun was banished to her room. Despite the fact that Braun and Hitler were effectively a couple for 12 years, very few people in Nazi Germany knew about it until after the end of World War Two in the west, such was the secrecy surrounding the relationship. Banned from going to Berlin, she spent her time in the countryside surrounding Berchtesgaden. Early colour films of Braun and her entourage exist of them enjoying their time: swimming, doing open-air gymnastics etc. However, the appearance given in these films is somewhat misleading. It is known that Braun attempted suicide on at least two occasions (1932 and 1935) such was the loneliness she felt in isolation and the lack of attention that she got from Hitler. This increased even more when World War Two was declared and Hitler spent even more time away at Rastenberg or in Berlin. Despite his misgivings, Hitler allowed Braun to join him in his bunker in Berlin in the final days of the war as the Red Army enveloped eastern Germany. She arrived in Berlin on April 15th 1945 and declined numerous attempts to get her to leave the Führerbunker. The historian Heike Goertemaker believes that Eva Braun should not be viewed as an archetypal ‘dumb blond’: “she was far more than just an attractive young thing.” Goertemaker states in “Eva Braun: Life with Hitler” that Braun also shared a love of architecture and took part in the planning for an architectural revamp of Linz after the war had ended that would make the city the artistic centre of the Third Reich. Goertemaker also claims that the suicide attempts were never meant to succeed as they were Braun’s way of winning back attention from Hitler and that far from being the manipulated she was quite capable of being the manipulator. On April 29th 1945, Hitler granted the one thing that Braun wanted – marriage. After the short marriage ceremony, someone in the bunker addressed Braun as ‘Gnädiges Fraulein’. He was quickly reminded by Braun that he could now use ‘Gnädiges Frau’, a reference to the fact that she was now married an as Frau Hitler. After the marriage ceremony, Hitler went off to dictate his last will. On April 30th 1945, both retired to their private quarters and around 15.30 both committed suicide. In every sense, Braun got what she wanted – to die by the side of her husband. Dead Famous DNA‘ documentary (2014) is to be believed. The scientists tested samples of hair from a hairbrush used by Eva Braun and found that by sequencing the DNA, they found a small genome associated with Ashkenazi Jews.